The Commemorative Air Force’s iconic B-29 Superfortress “FIFI” returned from her Florida tour on Monday to join the collection’s B-24 Liberator “Diamond Lil” and C-45 Expeditor “Bucket of Bolts” at the Vintage Flying Museum, in Fort Worth, Texas. The VFM will become their new home for the next few years while the CAF determines the location for their proposed National Air Base. 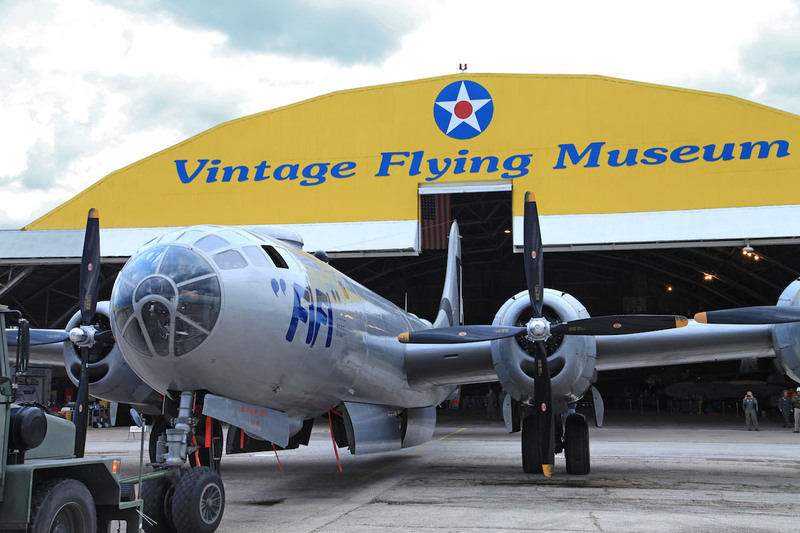 “FIFI” is no stranger to the well-known, yellow Vintage Flying Museum hangar, having spent time at the museum in 2011. The Air Force originally built the hangar to accommodate B-29 bombers in San Antonio back in the forties, but later disassembled and reconstructed it at Meacham Field. The late William “Doc” Hospers and his wife Chuckie purchased the hangar in 1990 and started their museum. For many years the hangar housed their prized B-17G Flying Fortress “Chuckie”, which the couple purchased in 1977. The museum is now home to over a dozen vintage military aircraft owned by the museum or on loan from private owners and other warbird groups. The VFM is located on the south side of the airport at 505 Northwest 38th Street, Hangar 33 South. As most readers will know, the CAF acquired “FIFI” in the early 1970s when a group of CAF members found her in use as a missile target at the U.S. Navy Proving Ground in China Lake, California. They rescued the airplane and flew her successfully for over thirty years until 2006, when the chief pilot decided to ground “FIFI” pending a complete power plant re-fit. The original R-3350-23 engines were never particularly reliable, even when B-29s actively served in the air force, and had become economically unviable to maintain by 2006. So the CAF replaced all four engines with a hybrid design, taking the best, most durable elements of several R-3350 variants and combining them into a far more practical powerplant. During the lengthy design, assembly and test period for the new R-3350-B29 hybrid engines, the CAF performed a much needed, and extensive four year restoration of the airframe and systems. “FIFI” returned to the skies in 2010 and has traveled coast-to-coast since that time attracting large crowds at every tour stop. “FIFI”, along with “Diamond Lil” and “Bucket of Bolts”, are available for viewing at the Vintage Flying Museum while not on tour. Please check out their tour schedules at www.airpowersquadron.org or call the museum at 817-624-1935 before visiting. 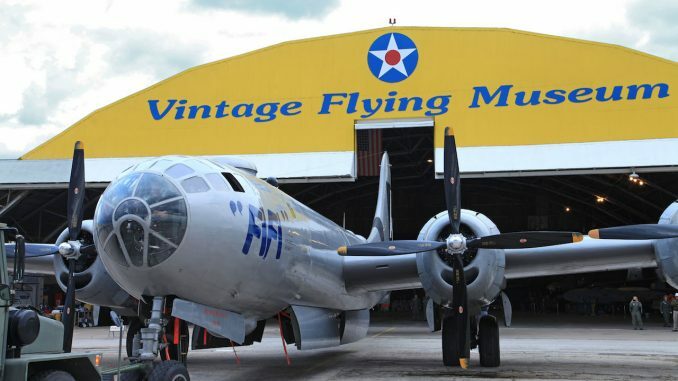 The Vintage Flying Museum of Fort Worth, Texas brings aviation history to life. The 501(c)(3) non-profit organization, features over 20 aircraft – including flying war machines from the Commemorative Air Force and Greatest Generation Aircraft. Guests experience the true nuts and bolts of vintage aviation as our volunteers preserve and restore historic aircraft to flying condition right in front of their eyes. From aviation history to aerospace fundamentals and career opportunities, students experience a hands-on approach to aviation in our education programs. Demonstration aircraft give guests the opportunity to live historic aviation the way it was meant to be, from the air! So join us to experience aviation – inside and out. For more information, visit www.vintageflyingmuseum.org. The CAF’s B-29/B-24 Squadron is a group of over three hundred men and women dedicated to the continued operation of the world’s only airworthy B-29 Superfortress, and one of just two B-24s still flying. The squadron is responsible for the maintenance and flight of these two significant WWII bombers. 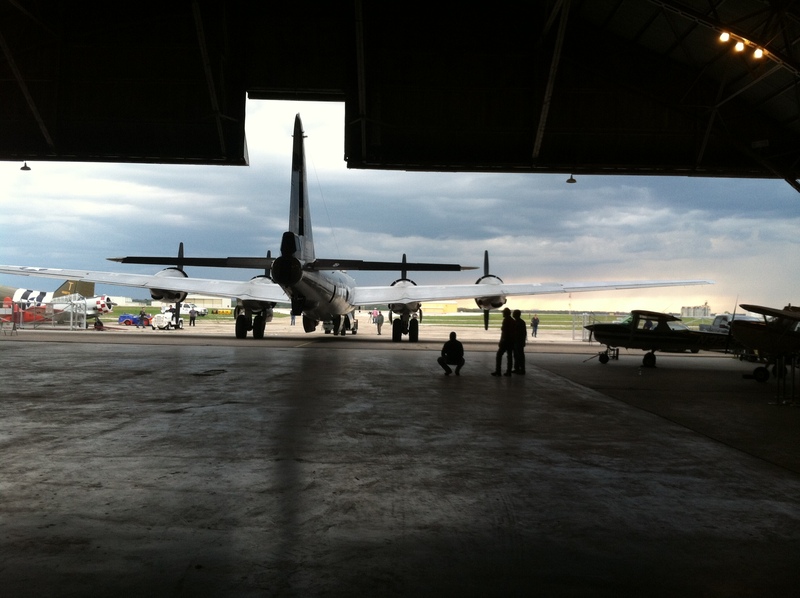 The B-29 and B-24 are feature aircraft in the squadron’s CAF AirPower History Tour. They tour the country with aircraft from other CAF units bringing “hands on history” to people across the United States. Please visit www.cafb29b24.org for more information about the squadron and our tour schedule. Collecting, restoring and flying vintage historical aircraft for more than half a century, the Commemorative Air Force ranks as one of the largest private air forces in the world. They are dedicated to honoring American military aviation through flight, exhibition and remembrance. A non-profit educational association, the CAF has more than 10,000 members and a fleet of over 150 airplanes distributed for care and operation between almost seventy units located in twenty seven states. For more information, please visit www.commemorativeairforce.org. I’m glad to hear about the re-engining; I have been aware of the engine problems of the B-29s ever since I was a child, living near Randolph Field. It is interesting to me that Wright never managed to sell a new type of engine following the debacle of the R-3350. More B-29s of the 20th Air Force were lost due to engine fires than to enemy fire during the raids on Japan. Evey time I have gone to an air show to see Fifi fly, she had at least one engine nacelle empty. Let’s hope the new engines are much more reliable, and get plenty of TLC. It just flew over my house, what a beauty!! Looks and sounds great!